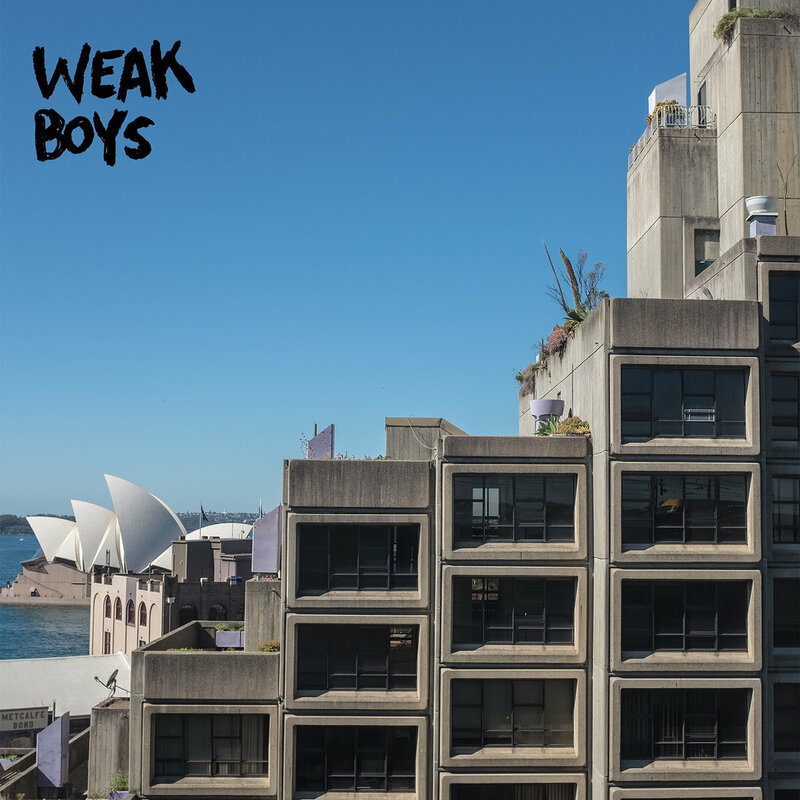 Strong Look Records / release / STR0000010 / Weak Boys "Weak Boys II"
Weak Boys "Weak Boys II"
All songs by WEAK BOYS: Matt Banham, Chris Yates and Craig Lyons. Recorded by Pete Beringer at Audile Design. Overdubs recorded by Weak Boys at Big Ibis Burger. Lani Crooks plays organ, flute, sings on "Professional Parents" and plays organ on "Horsin' Around". Jonny Maracas plays maracas on "The Second-Hand Car That We Deserve". Weak Boys logo by ROMI! (tm). Artwork, photos by Jonny Design (tm). It's time to say hello and welcome back to the (mostly) Sydney-based trio, the globe-trotting underdogs, the dog-patting champs of 2014-present, day-dreamers of dole-bludging days, the anthemic A-for-efforters — it's the mother-hugging Weak Boys. In early 2016, the tallest of the triplet threat, Matt "Matty" Banham (formerly of No Through Road, currently of Osaka Education Facilities and mattbanham.com) decided to chase his dreams and lodge an impenetrable timezone between him and the other Weak Boys — Chris "Yutts" Yates (Dollar Bar life member, Shrapnel pledger) and Craig "Reg" Lyons (Little Lovers, current Shrapnel time-keeper). Little did "Matty" know, but this wouldn't stop the band from gathering for a weekend in the first quarter of the year with Pete Beringer of Audile Design, near Sydenham Train Station (future designated lot for a NSW Planning approved gentrification outreach program). The result of the weekend of Simpsons trivia and deluxe feasts at the Portuguese Club is Weak Boys II, the band's second album, the unauthorised sequel to their acclaimed 2014 debut Weekdays/Weekends. While its predecessor took a squinted-eye view of The Good Life (infatuated with all areas of modern hedonism — drinking all day, moving to a dog farm, Diane Keaton), Weak Boys II spreads itself far thinner, squaring-up issues such as drugging all day, your drug dealer constantly holidaying in Europe, the cost of drugs, dreams and how to chase them, drinking gravy and, of course, the current destructive nature of their home town and its insistence that "green lighting" its own "fast-tracked" "blueprint" for a "swift and optimal" transition to martial law is perfectly OK.
Not as political as your Facebook Feed on any given Monday, but a helluva lot more comforting, Weak Boys II will hold your hair back on the morning after, mock you only hours earlier and deny both acts.